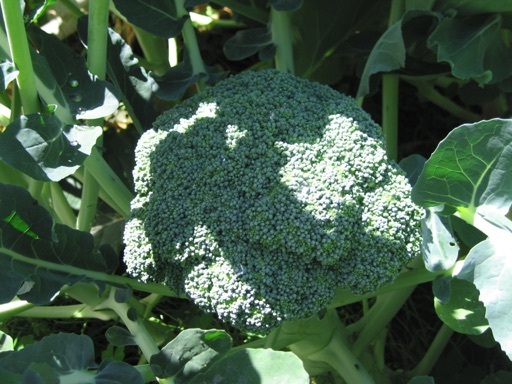 I have been growing broccoli in the late winter and spring for several years. Last February, I sowed broccoli seeds, and I planted broccoli transplants that I purchased from a nursery. I planted the nursery transplants directly into one of my raised beds in early Feb. I sowed the broccoli seeds in an outdoor pot filled with new potting soil in med-Feb. Contrary to what I said in a previous post several years ago, most of the broccoli seeds sprouted outdoors in about 2 weeks without difficulty in our relatively mild February weather. I then transplanted the seedlings from the pot into another raised bed in early March, about a week or 2 after sprouting. I mixed organic fertilizer (blood meal, worming castings, etc.) into the soil prior to planting the seedlings. This year, the plants that I grew from seeds have grown bigger and produced larger crowns than the nursery transplants. The pictures below are some of the plants I grew directly from seed. These crowns are as large or larger than the typical broccoli crowns I see in grocery stores. The nursery transplants produced small crowns in late April and early May. The plants that I grew directly from seed are mature now. In the past few years, they have continued to produce smaller crowns well into summer. 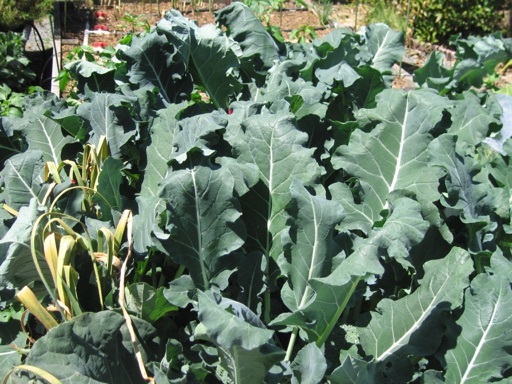 Even though I planted too many of the seedlings too close together, the broccoli plants I grew by seed, including and crowns, have grown as large as ever. I think the success of my broccoli by direct sowing can be at least partly explained by the fact that I was able to time the sowing of the seeds to cause the crowns to mature at the optimal time for our climate. Broccoli thrives in full sun and long days, which is why broccoli grows so large in southern Alaska during their growing season when days have 18 or more hours of sunlight. But broccoli does not thrive in heat. Its ideal growing temperature range is about 60-75F. 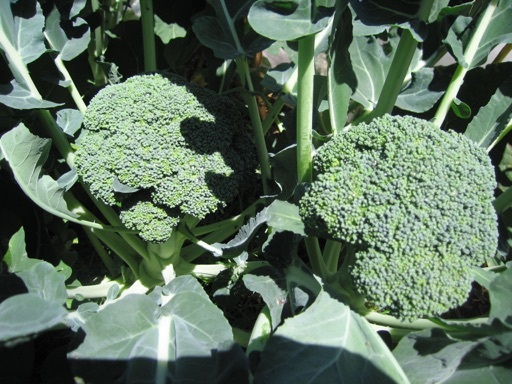 Therefore, the ideal time for broccoli to mature is in late spring or early summer right before consistent hot weather (80 F+) sets in. In our climate, that time is late May to mid-June. Broccoli seeds should therefore be planted here in Mid-Feb. 90-100 days prior to the target harvest time. Nursery transplants are often sold too early, at least for my area. Hot weather starts at different times of the year in our different local micro-climates. 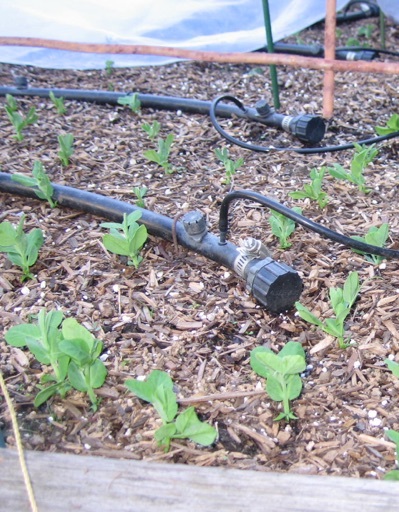 In areas that have many micro-climates, nurseries may not sell the transplants at the best time for all of the nearby micro-climates. Another reason that nursery transplants may produce small crowns is if they are root bound. Broccoli plants that have become root bound in a pot have lost valuable growth time. Although they recover and continue to grow after being transplanted, they don’t have as much time to grow as large as they could. For these reasons, I have defaulted to sowing broccoli seeds rather than purchasing transplants. Even though it is more work, the reward has been worth it. I have a small collection of 5 orchid plants. They are growing in our indoor sun room where they receive some early morning sunlight and some late afternoon sunlight. One of them is about 10 years old. Three of the others are 3-5 years old. Each of them has bloomed many times, even though I haven’t fertilized them in several years. They typically generate 1 or 2 flower stems once a year, but the flowers last for months. Orchid care has been pretty easy. I water them every 2-3 weeks by taking them outside and spraying them with a hose. Orchids hate standing water, so I make sure to let all of the water in the pots drain away before taking them back inside. I no longer soak them in a sink full of water. 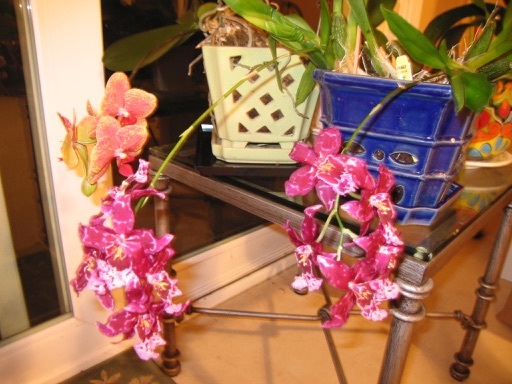 Other than watering, orchids don’t seem to need fertilizer or any other special care to generate repeat blooms. I like to experiment with new vegetable varieties. Last year, I decided to grow cauliflower for the first time. White cauliflower is available in most grocery stores, so I thought it would be fun to grow purple cauliflower, which I have never seen in a grocery store. 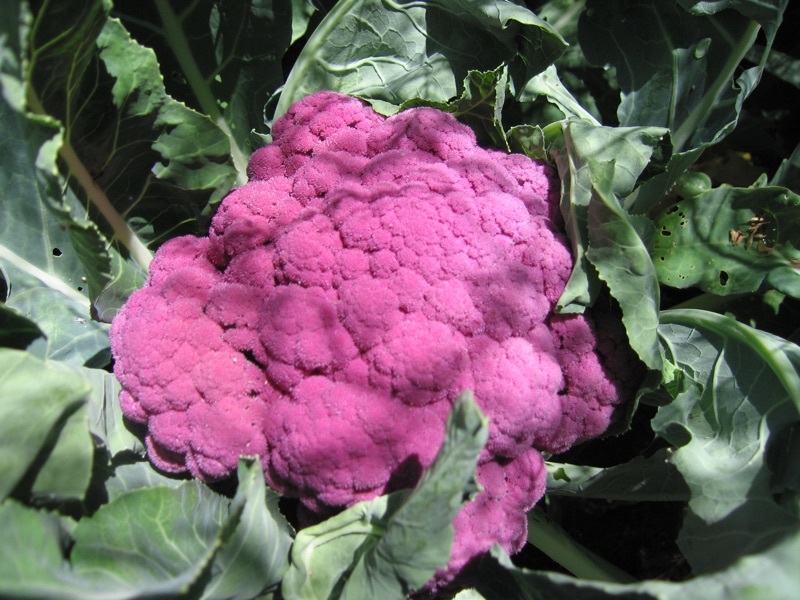 Last March, I purchased and planted seeds of two purple cauliflower varieties, Purple Of Sicily Cauliflower and Mulberry Cauliflower. After thinning and transplanting the seedlings, I grew about 6 plants of each variety. Both varieties grew into very large plants and produced large crowns of cauliflower, much bigger than typical broccoli crowns. After more than 4 months of growth, I harvested the cauliflower crowns in mid-July. The crowns of the Mulberry cauliflowers were very large and were a beautiful, bright purple color. One of these is shown in the picture below. Unfortunately, both varieties of cauliflower got attacked by aphids, even though I had most of them covered with mosquito netting. They managed to get under the netting, because it wasn’t tightly secure around the beds. The Purple of Sicily cauliflower crowns were nearly covered with aphids. Although still edible, most of the crowns were not appetizing to eat. Some of the Mulberry cauliflower crowns were mostly aphid free. I roasted them in the oven, because I really enjoy the taste of roasted white cauliflower. However, even after 30 minutes of roasting at 375 degrees, the crowns were still tough, chewy, and not appetizing, even though they had browned at the tips. They were nothing like roasted white cauliflower, which I have cooked many times. I still don’t know what went wrong with the consistency of the purple cauliflower being so tough. One theory I have is that I harvested them too late. They might have been more tender a few weeks earlier when the crowns were smaller. Other possibilities are that the heat of summer or failing to cover the crowns with the leaves (blanching) made them tough. Many sources assert that cauliflower is best in the fall. 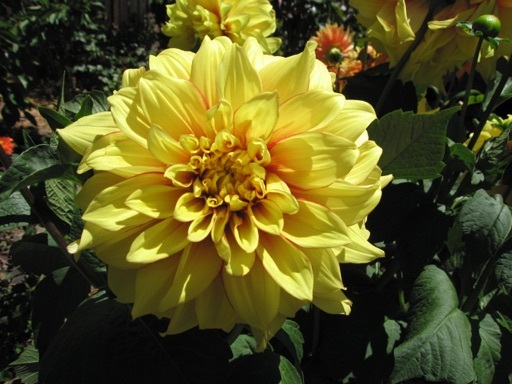 Last June, some of the big box stores in our area had a large selection of dahlia plants in bloom. 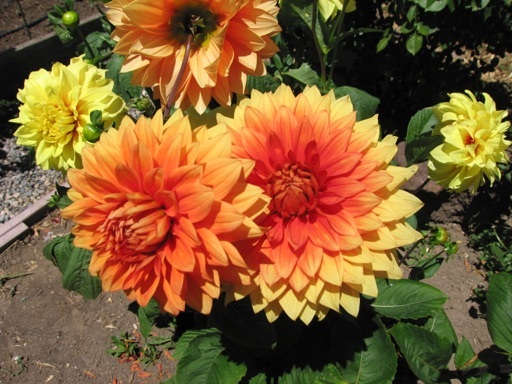 They seemed to have every solid color, but what most impressed me was how large the dahlia flowers were. Some of the flowers were 8-9 inches in diameter. 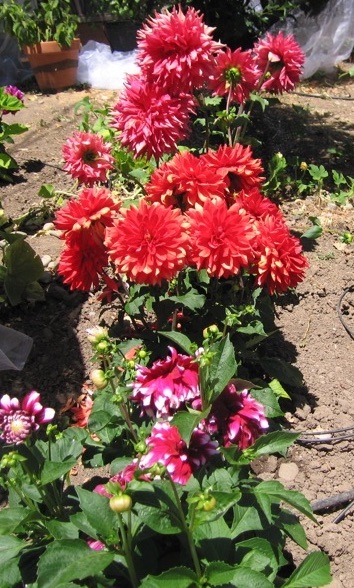 I bought red, magenta, purple, yellow, pink, and orange dahlias to add to my garden. 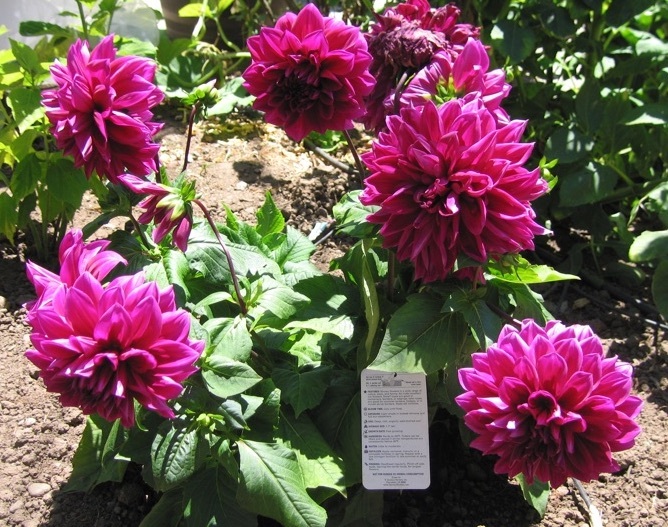 The magenta colored dahlia had the largest flowers (maybe 10 inches in diameter). They were full of beautiful flowers through July and into August, and they continued to bloom in Sept. Although starting in August, they got mildew on their leaves and produced less flowers. A few of the dahlias I bought last summer I kept in pots. Earlier this month, I transplanted those tubers, which are now dormant, from pots into the ground near our fence line. 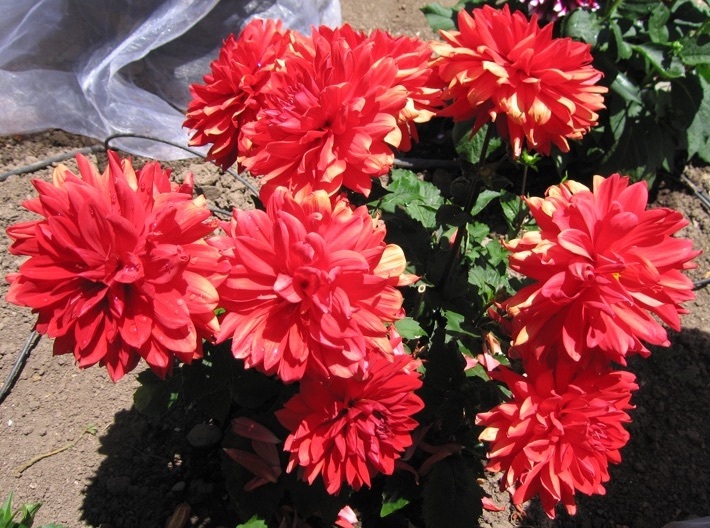 They usually don’t start coming up until April, so it’s not too late to transplant or subdivided dahlias. Below are some pictures from last July. Some of my fruit trees are already blooming in late February, including my nectarine, almond, and mutli-grafted pluot, which is shown below. 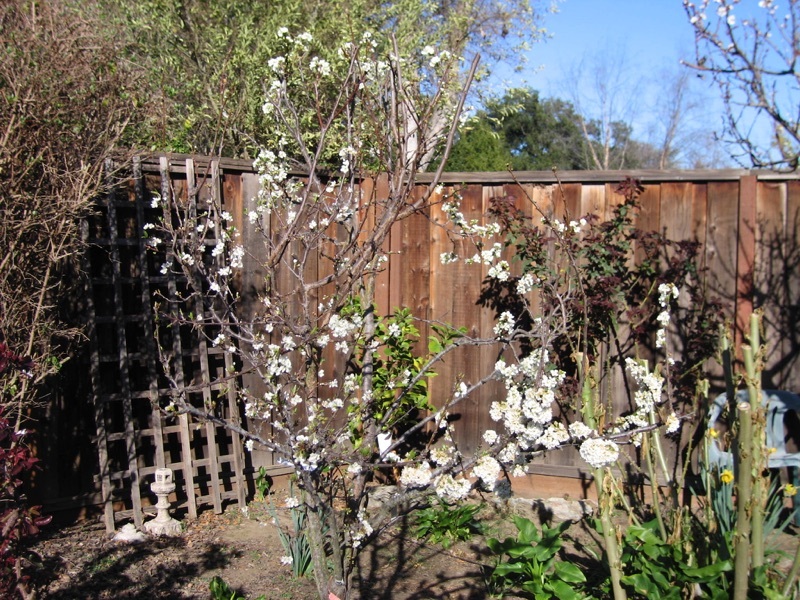 The Dabble Dandy pluot graft is full of blossoms after having set no fruit last year (lower right in picture). The blossoms of Dabble Dandy and Flavor Supreme pluots are overlapping with the later blooming Flavor Queen and Flavor King pluot grafts (upper left and right, respectively), which need to be cross-pollinated by Supreme and Dandy. Last year, the King/Queen bloom times did not overlap for very long with Dandy/Supreme, and none of the 4 varieties set as many fruits as previous years. Luckily, the weather for the most part has been sunny and dry, which should be great for pollination. This year, I set out sugar snap pea seeds in the ground early on Feb. 2 (Cascadia, Sugar Ann, Sugar Lace, and Super Sugar Snap varieties). I planted left over seeds from last year. Most of the seeds have sprouted. I have the bed covered with mosquito netting that is supported by sticks to keep the seedlings from being eaten. A part of this bed (with the netting off) is shown below. I planted these same 4 varieties last year. The Sugar Anns were the first to produce peas, in late April. Cascasdia produced the most peas, throughout May until mid-June. They were also the most tasty and my favorite overall. The other two varieties also produced well (mid-May to mid-June). Below is a picture of the 3 dwarf varieties (Sugar Ann, Cascadia, Sugar Lace) last Apr. 27. 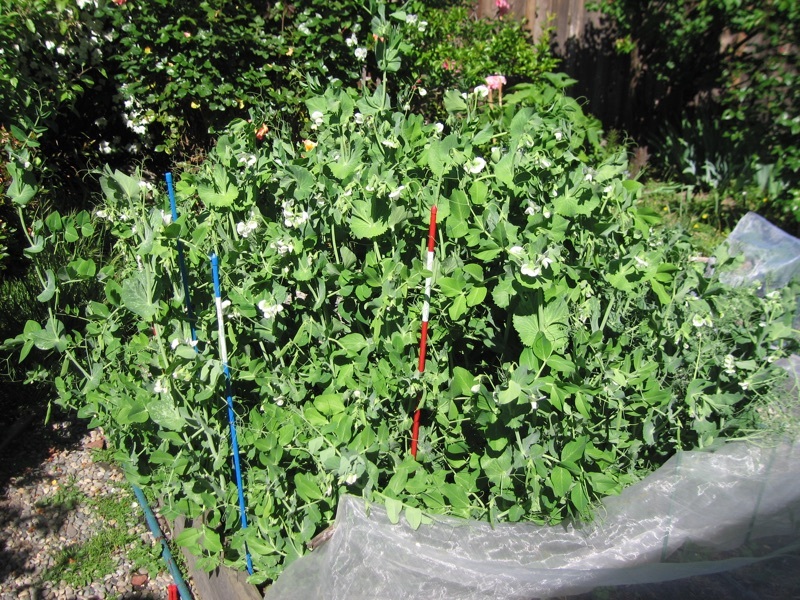 For a few weeks in May, they produced so many peas that I ended up giving a lot away. The quality of our peas has been very high season after season for the past few years that I have been growing them. I would rank sugar snap peas near the top of my list of produce that is most worth growing at home. 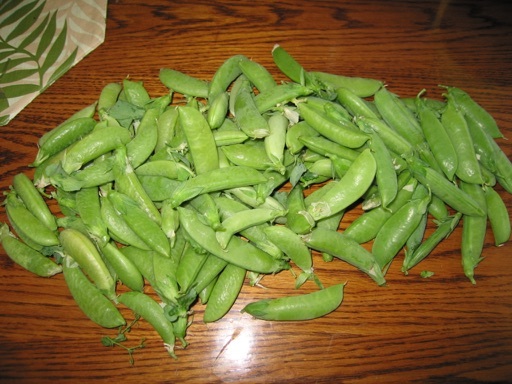 The pea pods are very crisp and flavorful, especially when compared to the taste and freshness of store bought sugar snap peas that I have purchased. And I can’t say that about all home grown produce. My home grown potatoes, for example, have not tasted different than store bought potatoes, although they were fun to grow and pesticide free.